Sad November | What a Beautiful Mess! I don’t think there’s a better name for a fair this time of year than “Sad November”! I find that the lustre of fall has waned with the complete death of all leaves and greenery, at least in my corner of the world. We’ve been having some very gloomy days up until today with the sun not shining at all during the nine or so hours it’s up. The day passes with no change in lighting and with the lights on inside it’s hard to tell what time of day it is. Today though the sun broke through, there was a warmish south west wind and it lifted my spirits immensely! A few of us hardy prairie souls spent the afternoon out in the pasture wild crafting for rose hips, enjoying the fresh air, some great camaraderie, and maybe one of the last warmish days! 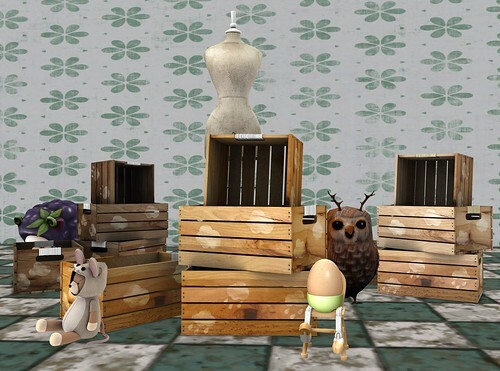 So, Sad November, in Second Life, is a collection of over 80 top designers, all with an exclusive item for the fair! Bokeh is there with some great looking clutter for your home! Now, I’m pretty much an expert in clutter and I’ll admit that mine in real life is sure not as nice as this! The Cloudy Crates come in a stack of three for a total land impact of two. they come in three colours, rustic, natural, and sandalwood in order from left to right in my picture here. They are are perfect to make a house so much more homey! I scattered a few great gacha items I have in my inventory around the area to add to the clutter! The Jim Mouse Bear from Boogers, the Humpty for Breakfast in green from Ohmai!, the dress form from Apple Fall, the Carved Woodland Animal-Fawn Owl-RARE from Half Deer, and the Kerfuffle Sheep-Blackberry-RARE also from Half Deer!